For all commercial applications including aquariums, zoos, water parks, swimming pools, aquaculture and water treatment. These single piece, all fiberglass filters are an excellent choice for any flow rate. With a small footprint and stackable, they can be installed most anywhere. High capacity fiberglass side mount sand filter without valves, this filter series features multiple diverters for increased filtration rates in commercial applications up to 20 GPM/sq. ft. Both have an 8” opening for easy access to the sand bed. The C-3 series features standard 3” valve connections. Natare’s high-capacity, cost-effective filters are designed to meet the demands of any project, whether the pool contains 5000 gallons or 5 million. Our engineering and design resources combined with our cutting edge manufacturing capabilities provide a custom-built filter to meets your exact project needs. Natare filters are ideal for competition pools, training and lap pools, water features, recreational pools, spas and specialty pools. Natare MicroFlo filters are fabricated from low carbon 304 or 316 stainless steel, (or standard carbon steel) with corrosion-resistant internal assembly. Available in a variety of sizes and options, MicroFlo™ equipment is designed for dependability with minimum maintenance and upkeep. 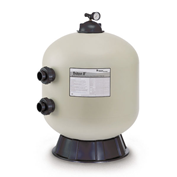 Natare’s MicroFlo vacuum sand filter offers the most economical, durable and high quality filtration available. The uniquely designed flow-diversion screen and simplified operating controls take the guesswork out of water filtration. These features allow easy access and a visual check during the filtration process. 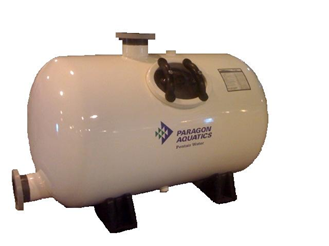 The open stainless steel tank is available in compact and wet-well configurations. The wet-well portion of the filter contains the filter bed, and specially designed filter laterals attached to a stainless steel collection manifold, and a stainless steel backwash trough. 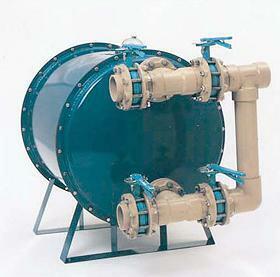 The compact filter includes the recirculation pump and all piping and valves required to control the filter system. With the compact filter, the entire pool’s mechanical system arrives prefabricated and ready for final connections. A Natare MicroFlo pool filter system can reduce your water consumption by up to 80%. Through carefully designed hydraulics and “air boost” backwash, thousands of cubic meters of water are no longer lost during each backwash cycle. 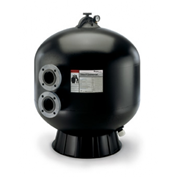 Natare MicroFlo vacuum sand filters substantially reduce maintenance costs. Compared to the partial cleaning that occurs with typical pressure sand filters, MicroFlo provides complete backwash and cleaning of the filters. The filter cycle of a Natare MicroFlo is a minimum of 30-days, rather than the 3-5 day filter cycles of a typical pressure sand filter. The MicroFlo vacuum sand filters eliminate the need for separate hair and lint strainers, saving more than an hour of staff time per day. 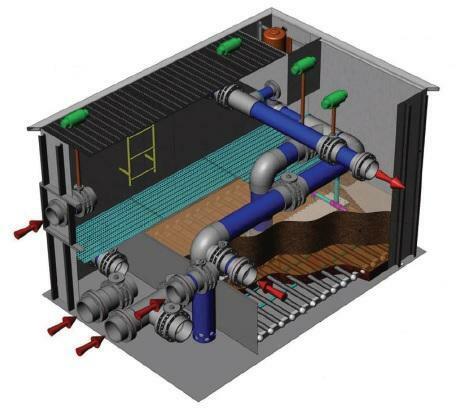 Additionally, Natare MicroFlo vacuum sand filters are delivered to your site complete with all required pumps, valves, controls and media; reducing installation and construction time by more than 80%. Natare’s exclusive MicroFlo Hi-Rate filter system offers flexible, efficient filtration for compact spaces. Small enough to fit through conventional doors, this Stainless Steel filter “cell” can be used on its own or can easily expand to multiple-cell tank (Horizontal or Vertical) configurations. Flow rates up to 20 gpm/sq. ft.